When replying to technical questions, I find that screenshots do the work so well for beginners. Then again, when I realize I should probably include screenshots to make my answer clearer, answering becomes more of a chore and sometimes I'll just skip altogether. I normally just do the regular print screen, paste in photoshop, crop and save to jpg then upload. I'm wondering though, is there a better tool for that specific type of situation for PC? I've tried the Snipping tool a few times but found it not so straightforward. What do you use? Is there any way to have a similar shortcut as the one on Mac where you can select and it saves to desktop automatically? I would recommend the ShareX (FREE for personal and commercial use). It incorporates almost any method of screen capture you can imagine, like: Fullscreen, Active window/Control, Active monitor, Window menu, Monitor menu, Polygon shapes, Freehand and so on. 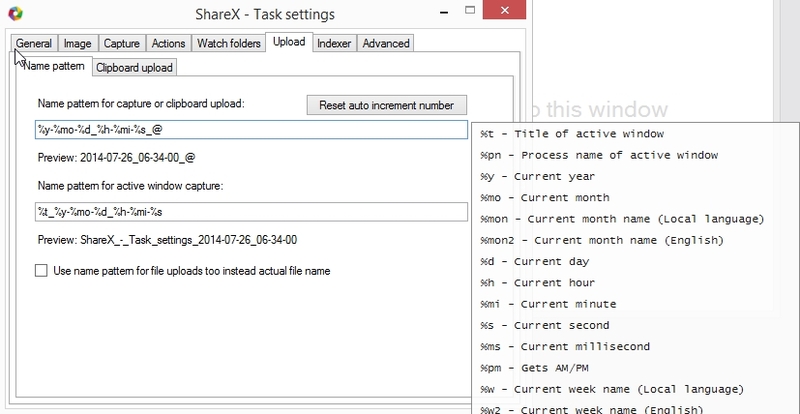 Additionally it supports After capture, Uploading and After uploads tasks. But what is the most important thing it has highly customizable settings: you can assign your custom hot keys, change the default output file name (using dynamic fields such as: current day, minute, random number) the default location for the images, default border style, and many many more! IMHO the best screen capture tool ever! 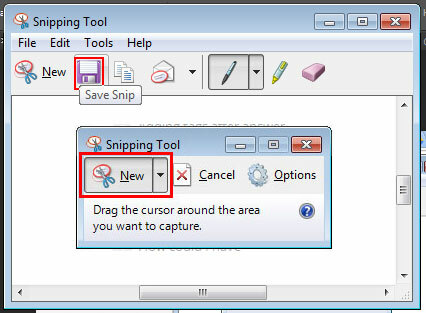 Snipping Tool in Windows reference Use Snipping Tool to capture screen shots is the best option that I am aware of for PC. If you dont like the Snipping Tool the best alternative I've seen based on reviews is Greenshot but I've never used it. If you are on a Mac you would use cmd+shift+4. 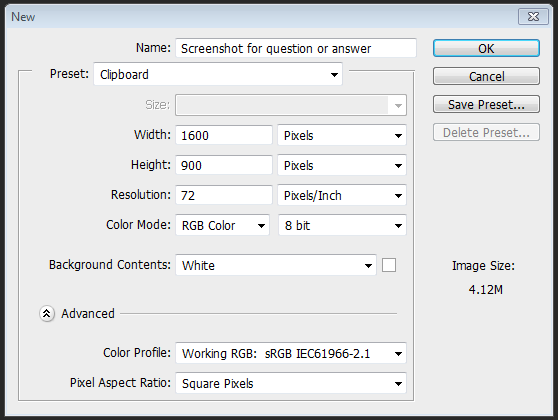 Most Efficient: Print Screen → Create a new canvas in Photoshop with the measurements of the clipboard object → Paste → Save for Web.. 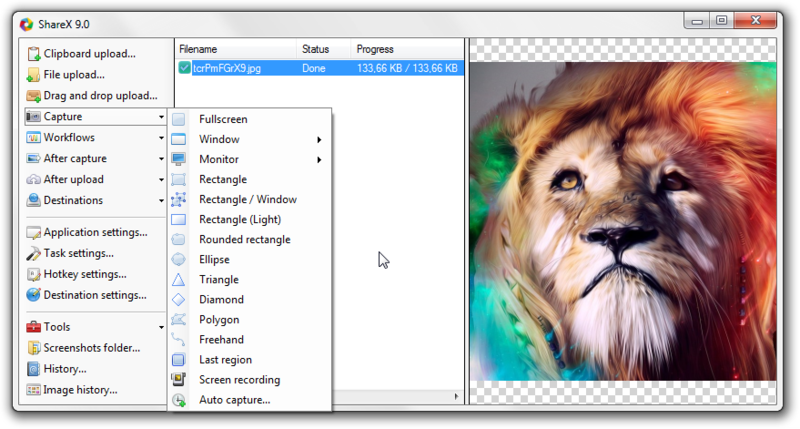 Create a new canvas/artboard roughly the same size as you need the largest screenshot to be. Take a screenshot of each step, pasting each one into the AI or PSD before taking a screenshot of the next. Don't worry about arranging it until you have all of the screenshots you need. Arrange all of the screenshots, try to align them as consistently as possible; it looks, reads and informs for users better. Hide all layers except the first step, Save for Web... and iterate through, hiding and showing each step, saving them with the same name and an incremental number ie. artistic-effect-step-1.png; artistic-effect-step-2.png; etc. 4a. If you need to highlight certain parts, now is the time to do it. Before saving each step add what you need to; it's easier than highlighting everything for every screenshot before saving, because then you might have a lot of objects to hide and show, and it can get confusing and messy. The maximum width that an image is displayed at on SE is 630px (scale that up for devices with higher pixel density, but still relatively the same). If you upload something that's 1531px wide, the browser will need to scale it down and it might not do so well, depending on the factor it's got to scale by. It's better to scale the image in a graphic editing software when you save the image; specifying a width of 630px, 1260px, 1890px or even possibly 2520px (no idea why you'd need to do the last two), so that it is scaling down with a comfortable ratio such as 2:1, 3:1, 4:1 etc. instead of something awkward like 24:7 and also because graphic software are much better at scaling than browsers. If you're creating a list and adding screenshots to numbered or bullet pointed steps, add a space before the image to align it with the list, and to avoid breaking your numbered steps (if you don't add the space, the next numbered step will start from 1, even if you wrote 5). Also, if you want to add comments in between screenshots, add a single space before them to keep them aligned with the list, and again stop number sequences from breaking. If you want to show hover tool-tips in your screenshots, you have to use the print screen method. You need the cursor to hover over the element, so you can't use the snipping tool. To set the width of an image it must have a title="" attribute or an alt="" attribute but it cannot have both. I personally opt for the title attribute because you can show a custom message when they hover over. To get an imgur link to add to the html <img> tag, just upload it in the normal way, and copy the newly generated link at the bottom. That's all for today folks, I'm sure there's things I missed but I'm out of time at the moment. Hope it helps. There's a free tool called Jing, made by Techsmith (makers of Camtasia and SnagIt), which is what I use. It's simple, can be set up to work with a keyboard shortcut (I use Ctl-Alt-Shift-F10) and is very smart about selecting windows, dialog boxes, panels, or arbitrary selections. 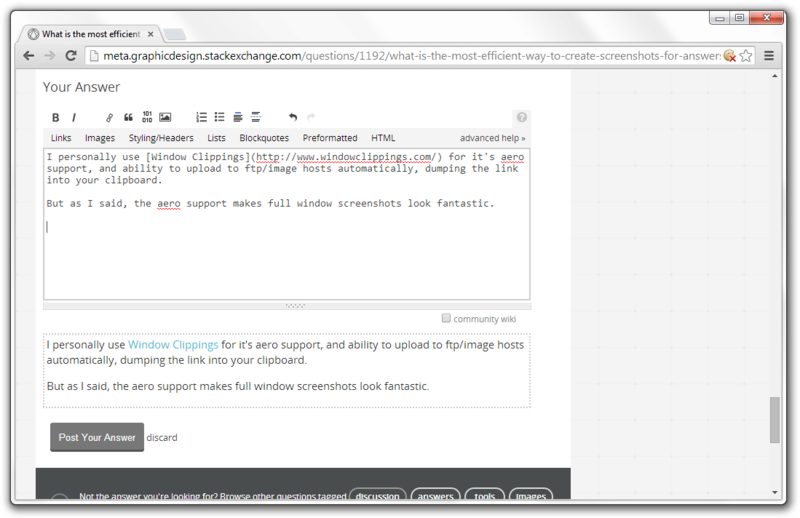 The screenshot can be saved or copied to the clipboard, and can be annotated prior to saving/copying. You can record simple movies with it which are saved as .swf, but can be converted with Adobe Media Encoder to anything you like. The only thing it won't do is copy open menus or the cursor, which SnagIt will do. I personally use Window Clippings for it's aero support, and ability to upload to ftp/image hosts automatically, dumping the link into your clipboard. But as I said, the aero support makes full window screenshots look fantastic. I really like Gyazo for quick easy screenshots, especially for this site because when you take a screenshot, it automatically uploads it to the web for easy URL image embedding. You can just add it to your taskbar or dock and just drag to select a region and then it uploads to a secure, private, unsearchable URL for secure screenshoting. Also you can use it while right-clicked to show a menu (good for Photoshop users) It supports GIF shots up to ten seven seconds as well. Also, with a cookie, you can see a history of your previous screenshots for easy access later. Not the answer you're looking for? Browse other questions tagged discussion answers tools images . What Are The Rules For Chat? Would my question about pdf rendering quality be on-topic for GD.se? Are answers in images OK? What are the criteria for “community bumping”?